★★★★★ Nice quality puzzle of the United States. Very colorful so is interesting for the kiddos to look at. The only thing that might be a concern for some folks is that the board that the puzzle pieces fit into is an exact replica (state name, color, the capital and any pictures on the state pieces) as the actual pieces for the states themselves. Makes it extremely easy to put together so great for the 3 and under set but our 5 year old pointed out immediately that he won't have to really remember which state goes in each spot....so for that reason.....it was kind of disappointing. I would have liked it better if just the outlines of the state were on the bottom board so that it would be a little more challenging. That all being said, I still think its an excellent puzzle for the little guys to practice with. For the older kiddos, I ordered a harder puzzle where just the state outlines were used on the board. 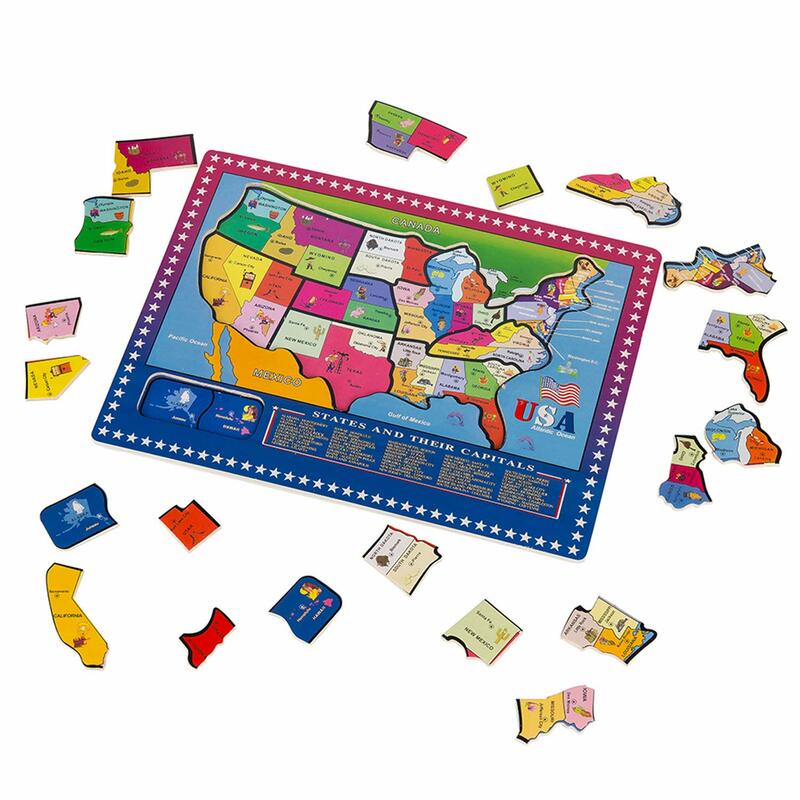 ★★★★★ THIS IS A VERY NICE WOODEN JIGSAW PUZZLE OF THE UNITED STATES FROM WONDERTOYS. THERE ARE 21 PIECES WHICH WILL MAKE IT FUN TO PUT TOGETHER. IT ALSO LISTS THE CAPITALS OF EACH STATE, AND ALSO INCLUDE A LITTLE PUCTURE OF WHAT THE STATE IS KNOWN FOR. IT HAS A NICE THICKNESS TO IT, AND IT SEEMS VERY STURDY. I BOUGHT THIS AS A GIFT FOR MY LITTLE 3 YEAR OLD COUSIN, AND I CAMT WAIT TO GIVE IT TO HIM. IT IS VERY COLORFUL AND ALSO LISTS THE ATLANTIC OCEAN, THE GULF OF MEXICO AND THE PACIFIC OCEAN. IT DOES SHOW CANADA TO THE NORTH AND MEXICO TO THE SOUTH. ★★★★★ I bought this puzzle for my 5 yr old grandson and he loves it! ★★★★★ Very well made. No rough edges. Bright colors. Easy for little hands to handle. Very educational. Each state marked along with the capitol. Letters very clear. Extremly Happy with this puzzle, exactly what I was looking for. ★★★★★ Wonderful puzzle. Great size for my 4 year old grand daughter. She loves it.